Was out at my old place in Meicine Bow yesterday. Long story, had to spend the night, it rained to beat the band and then added 1 inch of white fluffy stuff. Flakes bigger than 1/2 dollars. You should be seeing something in the near future. You should be seeing something in the near future. The wild apricot is very close to blooming, and everything else is showing signs of leaf or bud, so I'm getting excited about this spring thing at last. Now, of course, we just live with the mud for a while. LOL Can't win. 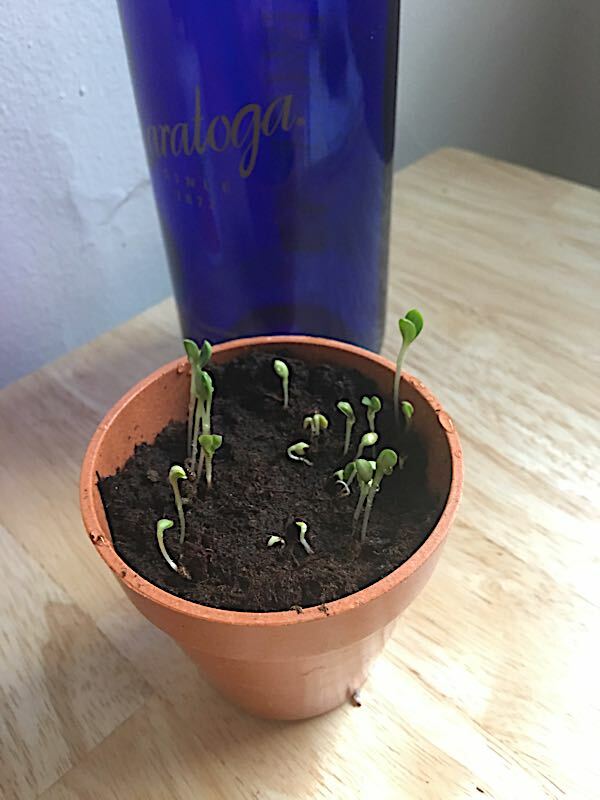 I have a black thumb, but somebody representing the local hospital was giving away flower seeds, dehydrated peat, and little containers at the local farmers market ten days ago, so I've been keeping them damp since then. And they're sprouting. Don't remember which kind of flowers, but if they live long enough to bloom, I'll post another photo. I don't know why but I just love seeing things sprout up from the earth that I planted. Talked with a coworker about cherry trees. He suggested a cultivar called 'Meteor'. I plan to get started on the deer fence that will surround the garden/orchard this weekend. Rain is coming today/tomorrow so hopefully it will be dry enough by Saturday to set posts. That seems to be a common issue. All the apple orchards out here have a handful of cherry trees amongst the apple. Upon asking about this the owner said the cherry trees were to feed the birds. I guess they like cherry more than apple. It was spring for a few days, night temps up into the 40s... and then... a big back step. We had snow and some rain this week, and night temps in the mid to high 20s, so I feared for the things that had bloomed and what I'd planted out already. Amazingly, after close observation this morning, everything but the apricots seem to have come through OK. No signs of fruit setting on either apricot, and my dahlias - just set out on the deck a few days ago - froze badly. The apple blossoms are all sticking (so far) and even the chamomile and parsley I had set out from indoor starts last week are OK. Not vigorously growing just yet, but hanging in there and green. The last seeds I planted out there, beets, have come up now and are looking good. Amazed, and very grateful. got my seeds from Sheffield's seed Co.
will see if I can grow an Osage Orange hedge around my place. Good heavens. Expensive. We have the Hedge balls from that plant every fall in the grocery store. A bit pricey. Supposed to repel mice and insects. I got some one time, but didn't think about saving the seed. Didn't see they did anything and never got any more. I'll have to rethink that if deer don't like to eat them! Wonder how fast they grow. From my research of Osage Orange, the hard part is getting the seeds from the fruit. You just don't open it up like an apple. They need to freeze for 30 days in water, for them to open up, then another 30 days of cold for them to geminate. after that, they grow pretty fast. want a tree, do nothing and let it grow, in time it will get to 40 feet tall. want an hedge, prune back the first year, til you have one branch, then bend down to the next plant, an on and on all along your hedge. like any hedge, it will need pruning, but will keep the critters out, or in depending on your setup. And I'm sure that would work if you have any actual soil to plant them in. I've got clay and rocks. sigh I planted Siberian Pea Trees ten years ago, and most are no taller than when they were planted... though they thrive in Siberia!! The big problem is that the deer won't leave them alone for a minute... in spite of the nasty thorns. Maybe they won't eat the Osage Orange? I'm going to look that up. I may buy one of the fruits next fall and see if I can sprout any. 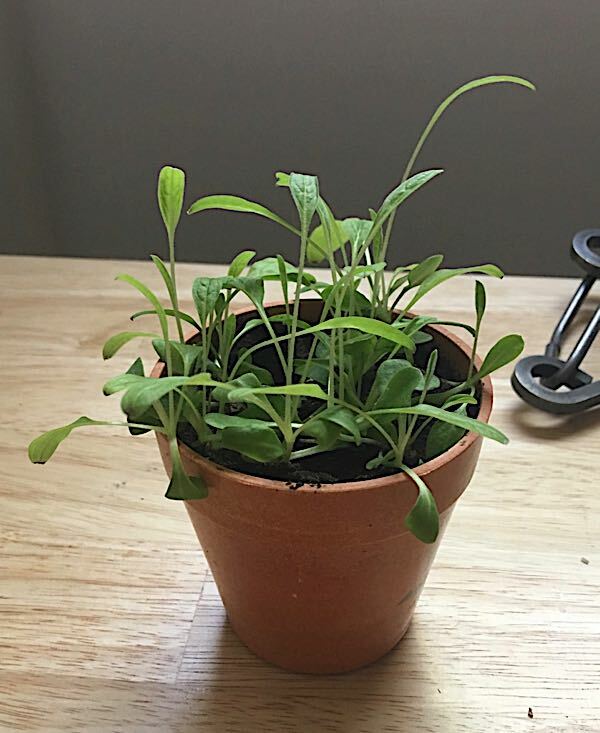 Here are my Forget Me Nots, one month later.